The margin debt alarm has seemingly been sounded every few months when investors realize absolute levels of margin debt have reached new all-time highs (inferring that risk taking has too reached all-time high levels). This brief post highlights why any such alarm (and any future margin debt alarm) should likely be ignored. Absolute levels of debt simply don't matter. As anyone who took an accounting or corporate finance course in high school or college understands, what is relevant are levels of debt relative to asset and equity levels. Taken to the extreme... does someone worth $2000 with $5000 of credit card debt have the same debt problems as someone worth $2 million with $5000 of credit card debt? Of course not. What matters is the level of debt to the assets that debt is supporting. Doug Short put together the below chart outlining NYSE debt and S&P 500 equity levels going back 20 years. 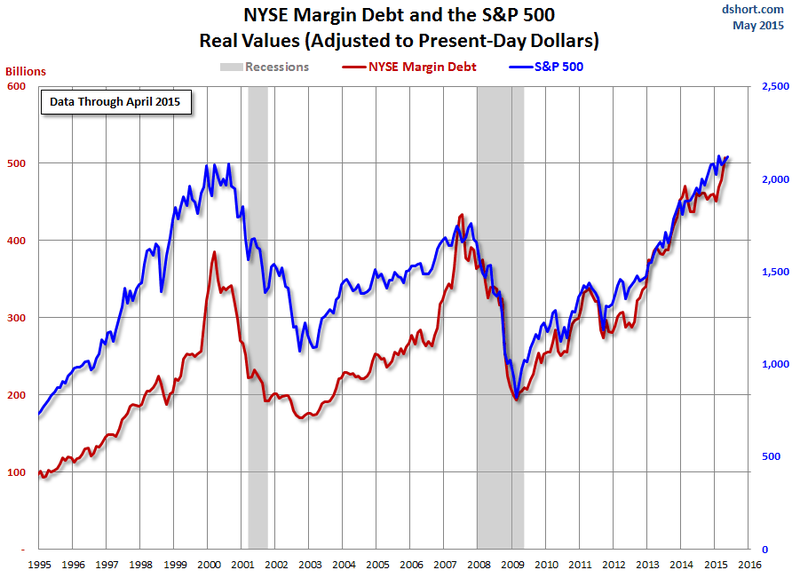 When viewed in isolation, NYSE Margin Debt levels (red) have risen sharply since 2009 lows. What has also risen sharply since 2009 are equity valuations. 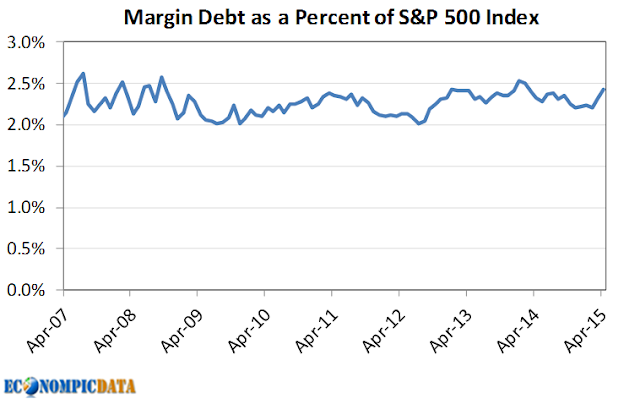 Context matters... while debt levels did rise more quickly than equity valuations from 2001 through 2007, since 2007 margin debt has moved in complete unison with stock valuations; margin debt has consistently stayed between 2.0% and 2.5% of the value of the S&P 500 index. This means margin debt has not increased at all when you account for assets that margin debt is supporting. Do Absolute or Relative Margin Debt Levels Even Matter? The only thing an increase / decrease in absolute margin levels tells you is how the stock market has done in the past. As markets rise, margin levels rise. As markets fall, margin levels fall. This can be seen in the bottom left chart (red), where 46% of the relationship over the past 20 years (the time frame in Doug's chart) has been driven by market movements. As all the other R-square levels attest, there has been very limited relationship with changes in margin levels and future market movements over the last 20 years and absolutely no relationship between historical or future market movements with the very small changes that have occurred in the relative levels of margin debt to S&P 500 valuations. So next time you hear anything about absolute levels of margin debt... ignore it.